It’’s Friday already?! I didn’t even see that week fly by it was that fast! 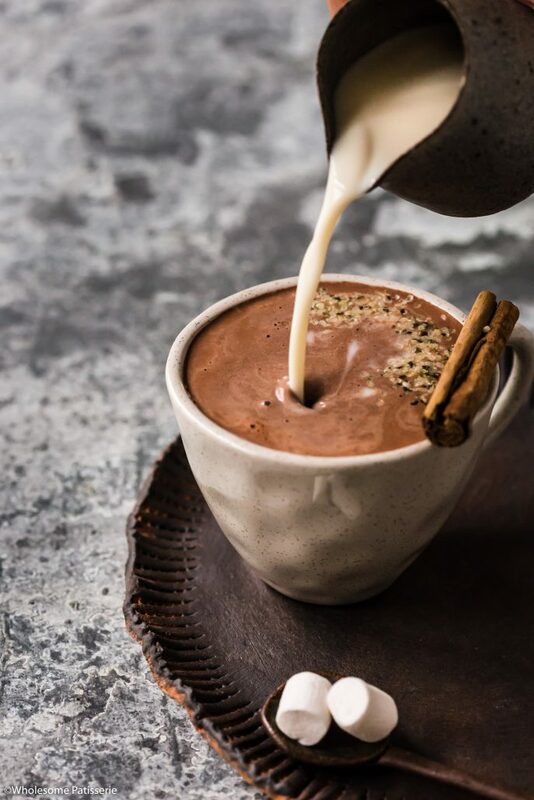 To finish and relax at the end of the week I believe this homemade hemp seed milk hot chocolate is absolutely perfecto! 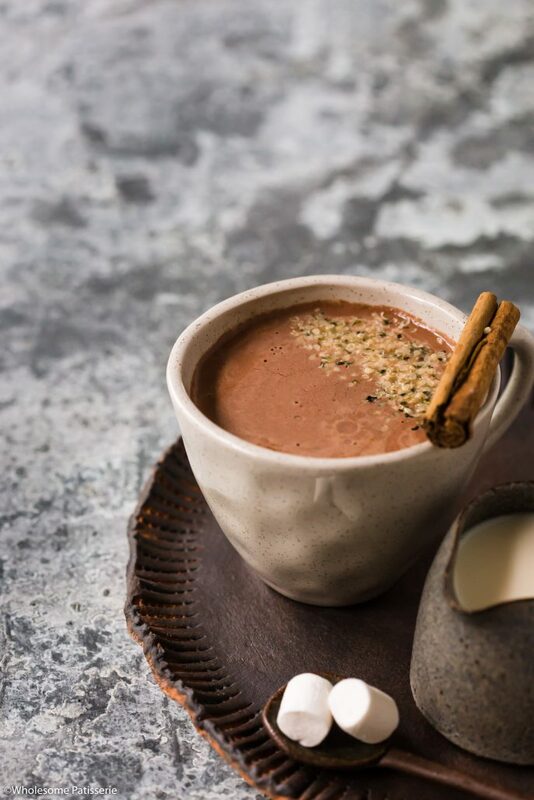 It’s a little unusual for a hot chocolate and you have to like or get used to the flavour of hemp seeds but if you already are a fan, then you might as well give this hot chocolate a try! It’s really simple, you just blend the ingredients together in your blender then add the mixture to a pot and heat it up, that’s it! The actual making of the milk is 2-ingredients: hemp seeds and filtered water! Then you add your cocoa (obviously – chocolate!) and a little vanilla bean extract and sweetener. I opt for my trusty coconut sugar but you can really use whatever sweetener you are used to and love to use in in you hot beverages. Otherwise you can already leave the sweetener out but honestly, it does help with balancing out the slight bitterness from the cocoa. 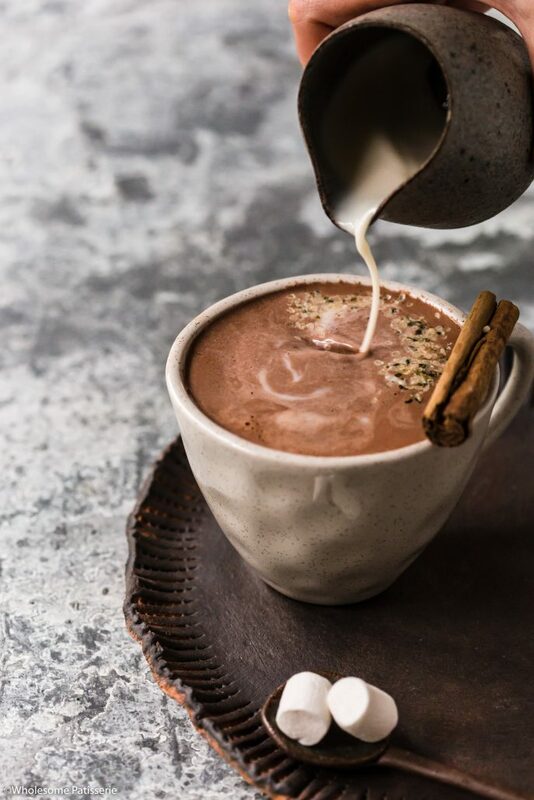 So if you enjoy your hot chocolate but you always feel a little guilty because it chocolate and sweetness, this is a healthier homemade option for you! You’ll receive all the benefits from the hemp seeds too, which are endless! Want to find out more about those benefits? Take a look over on Fair Foods website, have a browse and take a read, you’ll be amazed! Wishing you a wonderful weekend and hopefully you’ll have this hemp hot chocolate in your hot little hands soon!! In a high-speed blender, add water and hemp seeds, blend on high until well combined and water turns white/pale, approx. 20-30 seconds. To the blender, add vanilla, cocoa powder and cinnamon. Blend on high until well combined. Pour chocolate mixture into a small/medium pot and put over a medium heat. Add desired amount of coconut sugar. I add 2 teaspoons. Whisk well until dissolved. Continue to heat mixture over a medium-high heat until it begins to steam, don’t let it boil. NOTE: or heat to your desired drinking temperature. Find hemp seeds at your local health food store. *Alternatively, you can use 1-2 medjool dates to add sweetness in place of the coconut sugar. Or your desired sweetener of choice, such as honey or maple syrup.